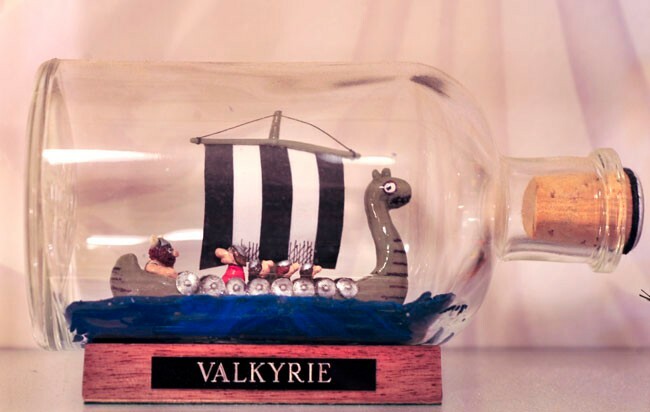 Building a ship in a bottle is generally regarded as a very unusual hobby for someone to take up, particularly in this day and age when time seems to be so precious. But that’s just what Terry Butler, who describes herself as “home hobbyist and artist” has been doing for the past seven years. 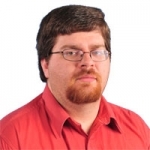 Terry was born in Midland, Michigan, and graduated from Midland High School in 1971. Shortly after, she began travels in Europe, where she met her husband, Buck Butler. Her interest in ships in bottles piqued when she saw her first actual ships in bottles in a shop in Cornwall, England, about 15 years ago. Terry was captivated. "I'd always loved seeing them in magazines. Here, I saw good ones for the first time, and lots of them, every one different. This was the first time I'd seen the possibilities of what could be done.” "Then," said Butler, "I saw the prices. We afforded one, but I wanted every one of them." "I thought if I could learn to do this, I could own this collection." About 10 years later Terry ordered, sight unseen, the book "Ships-in-Bottles," by Don Hubbard, a founder of the Ships in Bottles Association of America. From there, she began learning the art. Terry is one of only a handful on women in the world who build ships in bottles. She is very detail oriented and prolific in her modeling. Last year alone, Terry completed approximately 157 models. 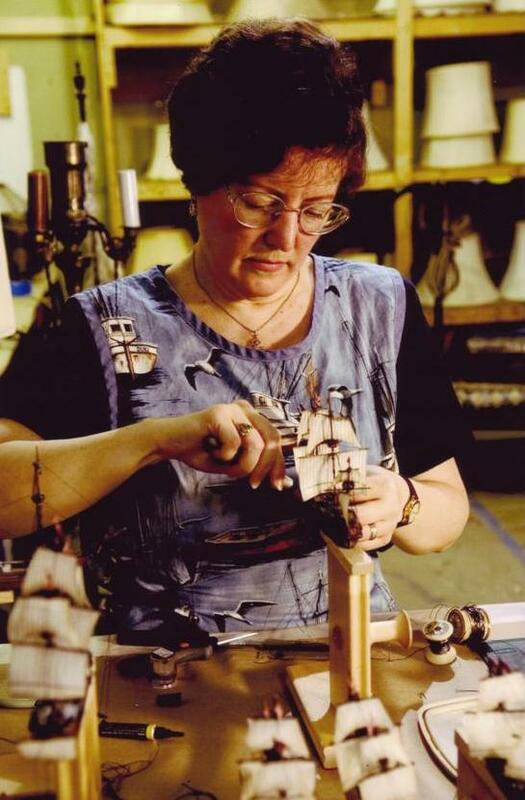 Today, she mostly makes ships inserted in pocket watch casings, and miniature bottles which, when finished, are housed in walnut shells. There is great demand for her pocket watch ships, mostly by word of mouth, and Terry admits that it is becoming increasingly difficult to keep up with the demand. Orders are sure to increase now that Terry has become the modeler/teacher for the Stars. 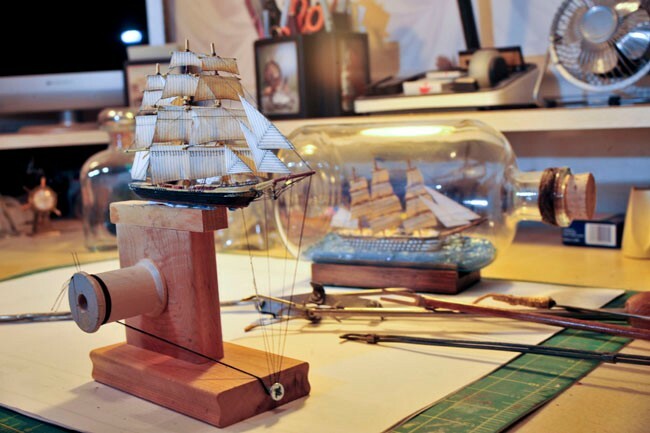 This past summer, Terry was commissioned to create about a dozen ships and to teach Matt Damon, and Eddie Redmayne, who plays Damon's son in the movie, “The Good Shepherd,” how to insert completed ships into the bottles. This movie is directed by Robert DeNiro and is scheduled to be released near the end of the year. Interestingly enough, it was Don Hubbard, whose book helped guide her in the craft, who recommended her for this role. 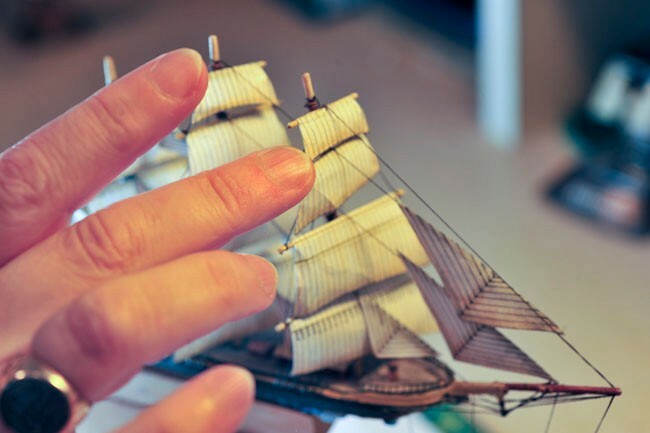 Terry’s work, and the ship in bottle scenes depicted in this movie, should help in increasing interest and appreciation for this hobby and craft. KINGSPORT — It takes two things to build a ship in a bottle: skill and patience. National Ships-in-Bottles Day will be celebrated for the first time ever today, making one Kingsport woman very happy. She’s been building ships in bottles since 1999 and is the current president and editor of the Ships-In-Bottles Association of America. 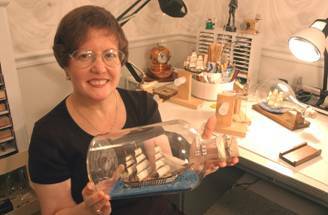 Terry Butler’s love of putting ships in bottles blossomed when she was living in England. Butler and her husband, who was in the Air Force at the time, had a limited budget and could afford only one of the ships on the wall. Ever crafty, Butler decided if she couldn’t afford to buy the wall, she would make her own. She made her first attempt at building a ship in a bottle in 1999. She found a book about the craft, but it confused her and some of the instructions in it were difficult to understand. So she called the publisher to see if she could talk with the author of the book. The author and publisher turned out to be the same person. Butler quickly found a mentor and, after getting her questions answered, she began building her own ships in bottles. After a few years with the craft, she was asked by the studio producing the 2006 CIA movie “The Good Shepherd” to make the ships in bottles that would be used throughout the film. She sold some of her ships to Robert De Niro for his grandkids and taught Matt Damon how to place a ship inside a bottle. In 2007, Butler was named president and editor of the Ships-In-Bottles Association of America. Putting a ship inside a bottle is a multipart process. The builder must find a bottle and choose a type of ship, being sure to measure the diameter of the opening of the bottle because the size of the hull of the ship has to be less than that of the opening of the bottle. Next comes the building of the ship itself. The hull is first, followed by the masts, spurs and sails — all built separately. Holes are drilled in the hull where the masts go. At the base of each of the masts, a hinge is added to allow the sails to bend at a 90-degree angle. 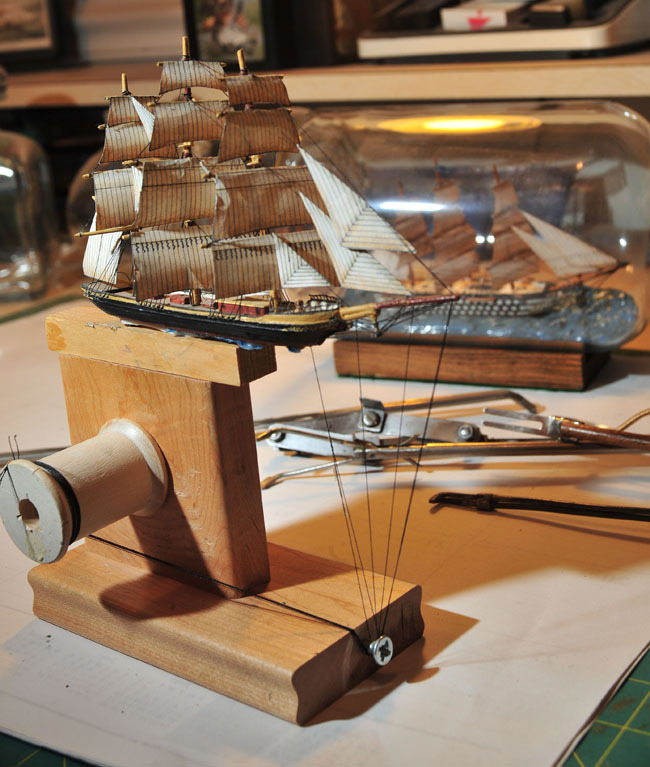 The masts and sails are added to the boat, and then thread is strung around them. The masts are bent forward and placed inside the bottle. The thread is gently pulled to raise the masts, one at a time. 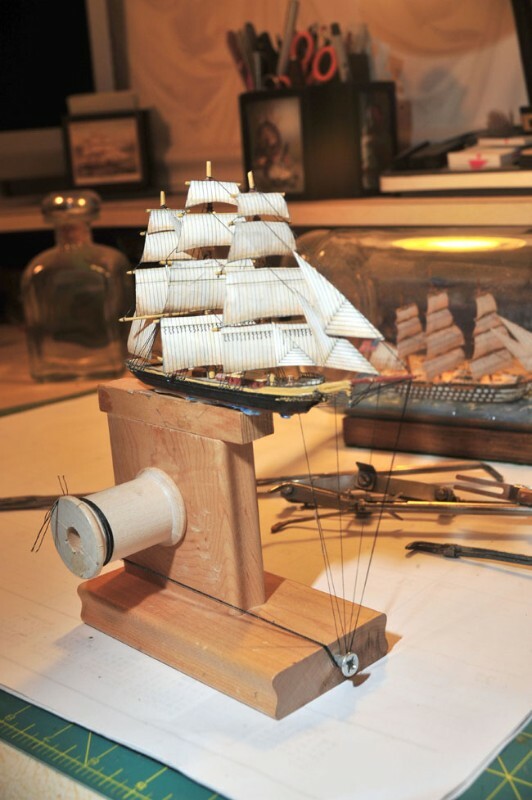 The thread is then cut away, the cork added and the ship in a bottle is complete. Butler said she can build a decent ship in a bottle in a week, if that’s all she’s doing. Usually, it takes her more time. A few years ago, SIBAA began lobbying for a National Ships-in-Bottles Day. The efforts fell short every time and at one point the group decided to give it up. Then the first president of SIBAA passed away. The association decided to try again, this time asking for the birthday of its first president. This time, the members got their day. To honor the first National Ships-in-Bottles Day, members of SIBAA are doing a group build that starts today and runs through April. Members plan to post their progress and updates to the group’s Facebook page.